With a B.A. in Apparel Design and a knack for style, Heather has run successful businesses in both women and children’s accessories. She designs fabric, sewing patterns, paper craft supplies, stationery picnicware and houseware. Just click here to hop over to Heather’s shop and all will be revealed. Now for her studio. Like Heather’s designs, her studio is calm, serene, modern with a vintage feel and super workable. 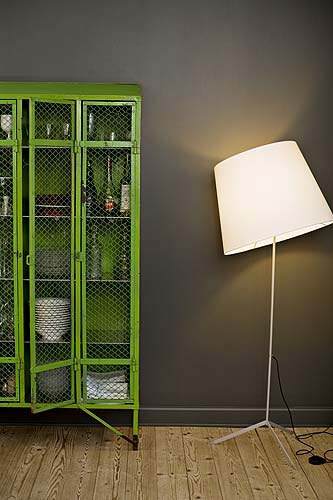 The tall green work-island has a ton of storage, with cabinets and drawers on each side. The cabinets contain art papers, zippers, vintage linens, interfacings, unfinished quilt-tops and stationery. In one of the drawers Heather stores sketchbooks and rulers but the rest she keeps empty for quick clean-ups. She repurposed a bookshelf by adding a base unit and repainting the poorly white washed top part – now it’s a super dooper proper dresser where she stores her art supplies, sewing notions and wool felt. The yellow boxes above hold less-frequently-used items, like velcro and grommets, linoleum blocks for stamp- carving, elastic and cording. Most of her furniture is “homemade” – the cabinet, computer table, sewing tabletop and shelves. What I love most is her personal touches. Just Look at this turquoise mirror. Read all about it in this post. And she used grandmother’s old sewing notions to decorate the large frame resting on the ribbon shelf. That’s it – Heather Bailey’s Sugar Shop Studio!! You can view her original post here and her Flickr photos here. Please leave her a comment to say thanks for sharing with us. As this is my last post for 2014, I would like to thank you all for reading my posts throughout the year. Have a Merry Christmas and Prosperous New Year. See you again around Blogland early in 2015. Hello, it’s Suzanne here today, taking you on a tour of a stunning craft room! This beautiful room belongs to Babs, from the website Button n’ Bows. When I first saw this room, I was instantly drawn to it… the blue/grey walls, striking white furniture, ample storage space, and the cute little chandelier over the center desk. Just look at all that storage! The center crafting area is made up of a table and two end units, all from IKEA. The desk was made counter height as Babs like to stand while creating. To the right of this desk is a comfortable sitting area for computer work. The desk and drawer unit are also from IKEA. There is plenty more storage behind the center desk! The ribbon holders are actually storage units made for the pantry, but Babs found that they fit her ribbon collection perfectly. If you take a look at the furniture, you will see even more pieces from IKEA. There are some adorable elements in this room, including all of the buttons and flowers, neatly tucked away in jars for a uniform look. The chandeliers and lamps, both real and vinyl, add such an elegant look and feel to this room. The final section of the room holds Babs’ Cricut machine and supplies, stamp pads, and embellishments. For a list of what’s included in the boxes, check out Babs post here. 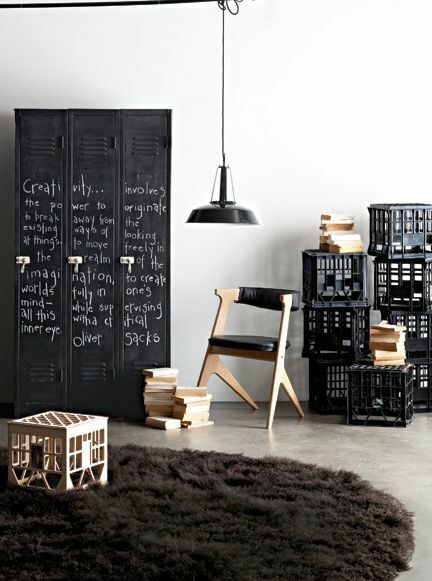 The boxes and furniture are also from IKEA. Make sure to visit the Buttons n’ Bows website to read all about this amazing craft room. Thank you for joining us today at Craft Storage Ideas. I hope that you found some inspiration for your own crafting space! Hi Everyone! It’s Cicily with a beautiful craft room to show you today. 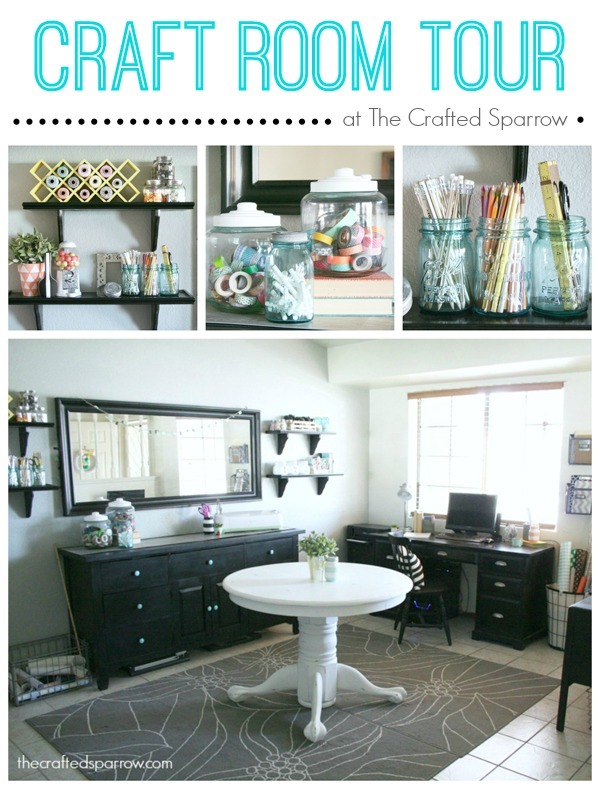 I came across Becca’s trendy room, the Crafted Sparrow, on Pinterest. She turned her formal living room into her very own crafty space. 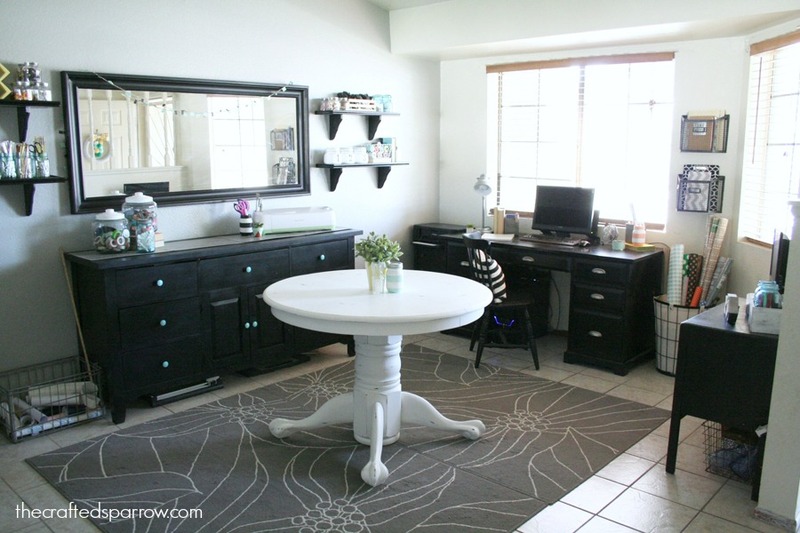 Becca painted her dark furniture black for a uniform look and her latest pride and joy is her Chalky Finish white craft table that takes center stage in her room. Her fabrics are housed in these bookshelves, with her favorites on display in the wire baskets. Like most of us, Becca admits to a wrapping paper addiction. I love her simple solution, this basic linen hamper. 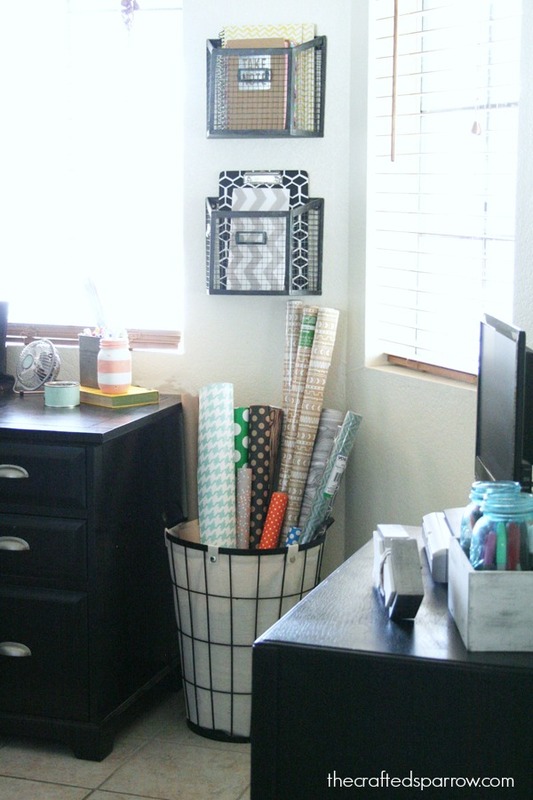 Check out Becca’s complete craft room tour on the Crafted Sparrow blog here! Tell Becca CSI sent you. I’m sure you will love her space as much as I did! Hello, Hazel here to bring you my take on “folding tables”. If you are like me, you would immediately think – camping!!! Not any more. We have been house-hunting for my son who is getting married in 3 weeks time and I can tell you this – you have to utilize every square inch to get value for the money you are paying. SO, why not invest in multifunctional furniture!! I was looking on Pinterest for ideas when it hit me – folding tables would be perfect for crafting, office space, to open up more options for your existing layout or simply to do homework. 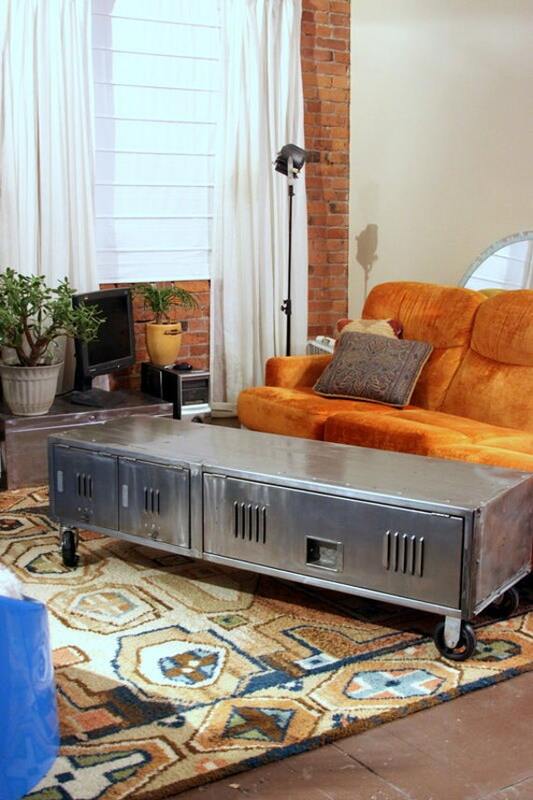 This one would be perfect for any space or any purpose – best part is that it’s not taking up ANY floor space. This a a great idea from DesgnPlanet. Unfortunately I couldn’t find the link. If you see it somewhere around Blogland, leave me a comment and I’ll insert in ASAP. Have a room but it doubles up as a spare bedroom / office / craft space??? This looks like the perfect solution. I bought one of these at a second hand store and it gets used a lot. Mine has a little door on one side where I hide all my boxes with embellishments, paperclips, flowers and brads. Remember this? However, I think my table needs a layer of this beautiful blue paint. And last but not least. DIY!!! When I start on a new venture, I make a Pinterest board – you can always delete it / re-allocate your pins. For the very first time, I’m giving you the link to my work-in-progress board. Have fun browsing through my inspiration here. Thanks for looking with me today. Please leave me some comments to let me know what you liked or would use in your own space. Have fun and remember to try something new. 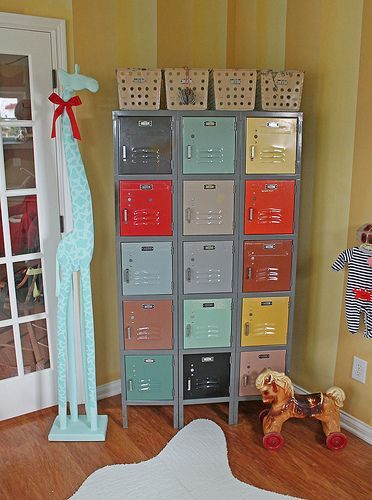 Hello, it’s Suzanne here with a look at some pretty crafty storage dressers today! These dressers range from minor creative alterations to full repurposing. I love to re-use and re-purpose what I already have on hand, and sometimes that means using pieces in non-traditional ways. When my son received a new bedroom set a few years ago, we were left with a dresser and nightstand that no one wanted or needed at the time. Desperately looking for extra storage for my scrapbooking supplies one day, I came across the forgotten dresser and decided that this would be a great place to store some of my stash! This dresser had the doors removed, was repainted. and then had the empty shelves filled with roomy baskets. The baskets are easy to see through, and have been labeled for ultimate craft organization. This pretty, pink dresser houses a ton of rainbow fabric. Color-coordinated and neatly organized fabric is easy to store and easy to find. This drawer organizes an array of craft supplies and accessories. The inserts inside provide much needed organization for such a large drawer. Having like-items corralled together makes it easier to find what you need for your projects. This idea is just genius! 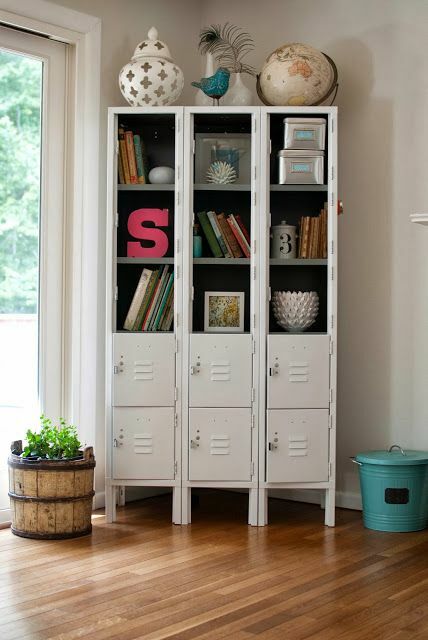 Can you guess what type of “shelving” was added to this dresser? Spice racks! That’s right, plain wooden spice racks were painted white and attached to the sides of the dresser. You could add your crafting magazines, how-to books, die cuts, etc. What about pretty, colorful ribbon spools, Washi tape, paints, or spice jars filled with small embellishments? This desk is amazing! It all started with an old dresser, a can of paint, and a vision. A larger top was added to give the desk some extra length and depth from the narrow dresser top it once was. And, those beautiful drawers remained, offering ample space for hidden supply storage. If you would like to see additional pictures, there is a nice tutorial on this desk on Nicole’s blog. 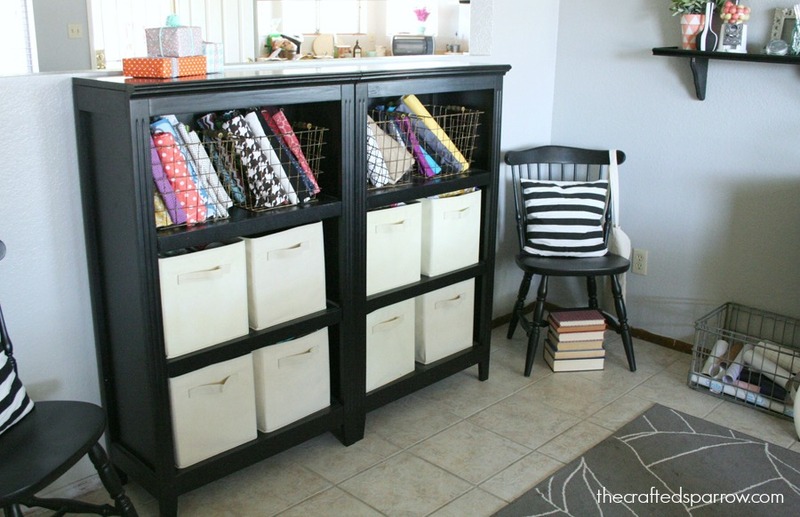 Do you have an old dresser sitting around that is just waiting to be re-purposed as craft supply storage? It is absolutely amazing at what some new paint and hardware can do to transform a piece of furniture. And with Pinterest and YouTube at our disposal there is not much stopping us from getting that perfect storage piece we are all looking for!